Seth of the Altered Page put together a great group of artwork in his Pulse #2, “Playing Favorites”. I continue to gather MY favorites as I go through his past challenge. Meanwhile the current round of questions is starting over at the Altered Page. Over 80 artists talk about their favorite tools, websites and mediums. Why they make art and what they collect. Back in the early 1990’s it was mail art and Artistamp calls. I hosted several years worth of special group anniversaries, holidays (Halloween and Valentine’s were my favorite) and celebrations of Chinese New Years, as well as a special 9/11 swap. When hosting one of these swaps it was most common for the host to simply collect and send out the address list and then everyone would mail out their contribution on a specific date. Then I (the host) would collect all the entries sent to me and document them on a web page or in a zine. The most fun was the mail that would fill your mailbox a few days after the mail date, and continue for weeks afterwards. Then I discovered ATCs and Altered Book Round Robins and Tip-in Swaps. “All about color“, “Good as Gold” “Monochromatic” and “Shakespere” were Tip-in swaps that I hosted and participated in over the past few summers with other Art teachers that want to do altered books with their middle school and high school students. The main altered book round robin that I did was a beginners one with different techniques to be accomplished each month as the books swapped. However, my book was held up by the first person that it went to, who then dropped off the face of the earth. She never sent it on, never responded to anyone’s emails and I never saw my book again. I even offered to send her money to mail it back. Alas. After months of playing in other people’s books and waiting for mine to resurface, I made a new version of the book and sent it off to the remaining participants. They were so wonderful to complete the challenges in my book and pass it on outside of the original calendar. But then, that is one of the risks and challenges with a swap. In 2003, the year I got my first dog, Charger, I hosted a A Dog Diary, visual journal round robin. I loved nervousness.org where I traded zines and music for years before they changed format. In June 2004, I helped to start a great collaborative community in the form of a challenge. An Art A Day was a yahoo group and LJ community. We challenged each other to make one NEW piece of art everyday. The LJ and Yahoo groups provided a place to post pictures, the opportunity to participate in continued monthly challenges, get daily quotes and motivations tips, participate in contests, share ebay sales of your work as you have them and get the general encouragement and motivation. I even created a website (which only the wayback machine now sees) for links, pictures, contests and challenges. We kept the challenge going for a several months. The culmination of this was a collaborative group calendar that we made. Every participant made 20 handmade pages that would be spiral bound along with weekly calendar pages. WOW that was a big project (since I was the one printing calendars, collating art and spiral binding) but they came out so wonderful! I still have mine and have added to it in visual journal style, since the calendar pages no longer apply. I got to know some wonderful artists during this challenge including Angie, Cheryl, Bridgette, and Stacey to name just a few. When I joined EBSQ I did it in the hopes of increasing my eBay sales. But I stayed for the collaboration. Each year there are themed shows to create work for, but several of them are set up as swaps. My nice collection of art is primarily made up of work I have received in these and other swaps. 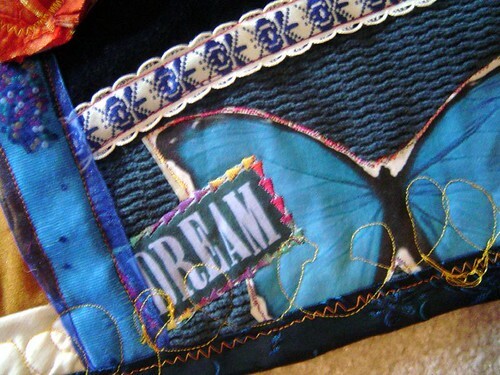 But I think my favorite swap, thus far, has been the Fabric Art Journal Swap. As much as I loved the pieces I made and sent off to the other participants, I really enjoyed the work I received in return. This can be tricky with swaps, because beauty is in the eye of the beholder, and apparently quality is also. This entry was posted in The Pulse and tagged AAAD, artistamps, ATCs, collaboration, groups, Playing Favorites, questions, round robin, swaps, Tip-ins on August 18, 2008 by Sheba.